Smoking addiction has a less caustic stigma than addictions to illegal substances like heroin or cocaine and, perhaps for this reason, is usually referred to as a bad habit instead of an addiction. However, what was once an almost universally accepted social activity has been increasingly legislated into a corner because of its serious health consequences for users and those around them. Although it is possible to smoke occasionally without developing an addiction, the obverse is the more common reality because the numerous chemicals used in the manufacturing of cigarettes tend to produce physical dependence (i.e., addiction) rather quickly. More than 42 million American adults smoke cigarettes; nearly 77% of them do so daily. Exposure to secondhand smoke in the workplace or at home increases risk for lung cancer up to 30%. Clearly, smoking addiction remains a challenging social problem. The signs[vi] of a smoking addiction are similar to signs of other addictive behaviors. 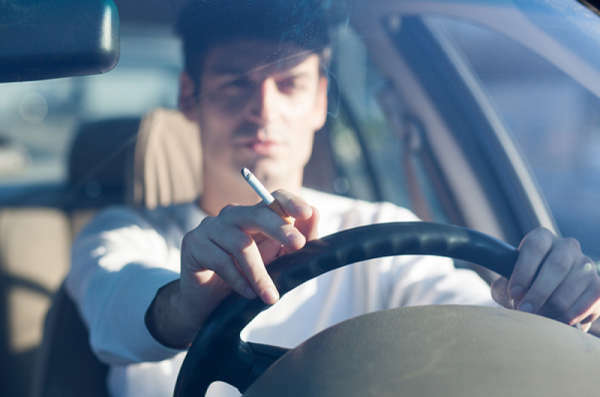 For many smokers, the addiction is very difficult to hide; their living environment, car, possessions, and clothing often retain the lingering smell of smoke. Many do not feel the need to hide it because cigarettes remain legally available for purchase. Secondhand smoke can lead to many medical conditions as well, jeopardizing the health of anyone who is regularly in the presence of sidestream (from the cigarette) or mainstream (exhaled by the smoker) smoke. This phenomenon is particularly concerning for fetal, infant, and childhood health; smoking around children increases their risk of developing multiple types of cancer, including a rare liver cancer that appears at a rate 5 times higher in children with two smoking parents (compared to kids whose parents do not smoke). [vii] Smokers also put children at risk for asthma and other respiratory problems. Most smokers try their first cigarette as a teen or even a child. Starting young increases the chances of smoking heavily as an adult. The people in your environment can influence your decision to smoke; smokers were more likely to have friends and/or parents who also smoked. Additionally, young people who have watched others smoking on the internet, or in movies or television shows, may feel compelled to smoke. If you have inherited nicotine-sensitive nerve-cell receptors in your brain, you may be more inclined to start and thereby develop a smoking addiction; thus, genetic factors influence the likelihood of getting hooked. Certain mental health conditions – including post-traumatic stress disorder (PTSD), depression, and schizophrenia – have been found to be associated with higher rates of smoking. An addiction to other substances – like illegal drugs or alcohol – more often appears in smokers than in the general population. Racial and ethnic background seem to be associated with smoking behaviors. The highest rates were found among multiracial groups (26.8%) and American Indians/Alaska Natives (26.1%); Asian Americans had the lowest rates at (9.6%). A higher percentage of American men (20.5%) are smokers (compared to 15.3% of women). Educational attainment correlates with likelihood of being a smoker; less than high school (24.2%), GED (41.4%), high school graduate (22.0%), and some college (20.9%) categories had higher rates of smoking. The numbers continue to decrease with increasing education: associate's degree (17.8%), undergraduate (9.1%), and post-graduate (5.6%). Individuals who live below the poverty level (29.2%) were almost twice as likely to smoke compared to those at or above the poverty level (16.2%). Insight into smokers' common demographic characteristics can help doctors, nurses, educators, policymakers, and other professionals better understand how to design prevention and intervention programs to decrease smoking and its long-term health care costs. Health insurance companies charge much higher rates for smokers than for non-smokers, and since government or employers are also picking up part of smokers' health care costs, there are often many incentives and resources available for those who are trying to quit. To end a smoking addiction, you will also need the support of family and friends; thus, if someone close to you is also a smoker, consider asking them to join you in your efforts. Otherwise, it may be more difficult (although not impossible) to quit. A popular treatment option is nicotine replacement therapy (NRT). Gum, lozenges, patches, inhalers, or nasal sprays release nicotine into your bloodstream, allowing a smoker to eliminate the numerous toxic chemicals in cigarettes while alleviating cravings for nicotine. The smoker can then gradually reduce (i.e., taper) the frequency and amount of NRT until he or she is no longer dependent on nicotine. Although some NRT items can be obtained without a prescription, working with your physician to find the best dose and tapering schedule – as well as to ensure that no other health risks will emerge while you quit – is recommended. Individual therapy and support groups are also recommended to help the smoker find healthy alternatives for coping with stressful situations that were once handled with cigarettes. For those who have tried to quit with NRT and therapy but have been unsuccessful, physicians may suggest Champix® (varenicline) or Zyban (buproprion). Both of these medications have been shown to have high rates of success among smokers who were trying to quit. Importantly, however, these medications could cause side effects and still require that smokers find healthy ways to resist cravings. Within a day or two of quitting the habit, the body begins to clear out the toxins, and the former smoker will gradually feel better; withdrawal symptoms will eventually subside. Depending on how long you smoked, it may take many years to fully recover and reduce your risk for lung cancer or heart problems to that of a non-smoker. But research has shown that stopping at any point offers more – and better – years of life for all smokers.